Tesco has said it has made a "good start" to the current trading year, although like-for-like sales in its UK stores have continued to slow. 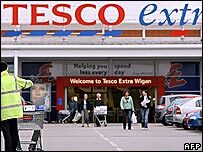 Tesco said like-for-like sales excluding petrol rose 4.5% in the 13 weeks to May 27, compared with 4.9% in the final quarter of last year. Group sales rose 10.4% and Tesco said it was on track to open a record number of foreign stores this year. International stores contributed 15.1% growth over the past quarter. Tesco's UK sales growth has slowed slightly in recent months, as higher energy bills have dampened High Street spending. Like-for-like sales - which exclude results from stores open for less than a year - rose 7.5% last year but have been slowing since the end of 2005. But Tesco said it had shown "solid growth" in a competitive market, with total UK sales up 9% over the period. "International is showing strong growth and pushing on well with new store development and the UK has made solid progress on top of two years of exceptional performance," said chief executive Sir Terry Leahy.